KooGa's high perfomance boot with synthetic upper. 8 studs with hard toe. Printed and embossed snap down tongue. Sizes as available. KooGa's high perfomance breathable boot. Internal molded heel counter, ISO Grip technology insole for maximum grip and feel. Embossed snap tongue and elasticated anchor. Sizes as available. SIZES AS AVAILABLE. 8 stud wide fit rugby boot. Black/red/white. 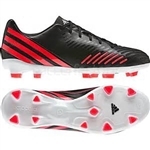 Iconic Adidas 3 stripes on the side of the rugby boot. width, ideal for forwards and players needing a wider fit. Sizes as available. SIZES AS AVAILABLE. 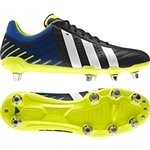 This 8 stud wide fit rugby boot features eye catching colours and design. 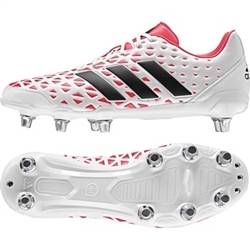 Iconic Adidas 3 stripes on the side of the rugby boot. 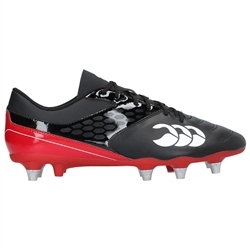 This 8 stud wide fit rugby boot features eye catching colours and design. 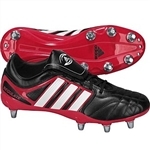 Iconic Adidas 3 stripes on the side of the rugby boot. Sizes as available. Colour is Black/Poppy/White. For firm ground. Synthetic upper with 3D engineered rubber for optimal grip on the ball. Outsole is perfect for firm ground or artificial grass. Sizes as available. An enhanced version of the popular Stampede Boot, the eight stud design provides front row forward insights with all of what they require on the pitch during competitive play. It is a securer, wide fitting boot that provides enhanced traction and durability in different weather conditions and offers unparalleled comfort and support to tight-five forwards. Soft Synthetic Upper Delivers Great Fit, Comfort and Durability. Ideal for players needing a wider fit. Textile Lined. Nylon 8-Stud Outsole with Reinforcement Zones, Provides Flexibility Up Front and Stability in the Mid and Rear.